**This week I wanted to do a “Fall Flashback” and re-post some of my favorites from the past two years, just in case you missed them. 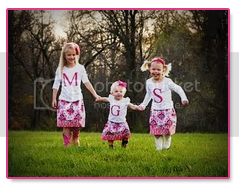 Here is another favorite, family photos, taken last November. It’s crazy to see what changes a year can bring….. Here are a few faves from our recent family photo shoot. It is our first since the addition of Gracie! They were taken by my friend from high school, Lindsay (Walker) Orr. Call her. Immediately. She’s amazing! And our baby, Gracie, with the cutest little smirk. She may or may not be holding one of the 10,000 smarties that were constantly being passed her way in hopes to get a smile. This one hangs on my dining room wall. Gracie was about to jump off the bench in this one. Look at her expression. Even though it was a bit stressful getting the girls to all smile and look at the camera, it was worth every single one of those smarties. This time in our life is captured forever. Thank you so much Lindsay for your hard work and amazing photos. Hey Marta - love these pics and the one you have in your dining is probably one of my favs! Gotta get my boys some pics soon... Loved your girls' little dressy tops - did you make them?